Now your undetectable radar detector is even more discreet and hidden away! 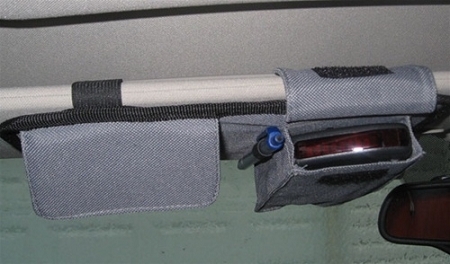 The Sunvisor holder looks like a CD wallet or garage door opener pouch. 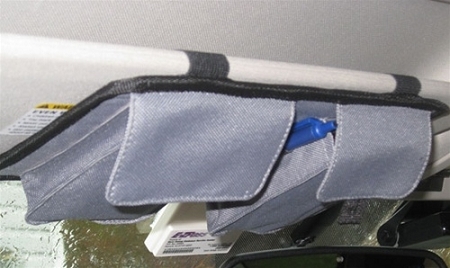 The right hand slot fits your Bel Sti or other radar detectors perfectly while the left hand pouch can holder sunglasses, wallets, phones and more. A convenient pen holder adds to this accessories usefulness. Well, at first I thought this was a good idea but it misses 2 important aspects. One: The Laser on the radar detector is enclosed ,so it's of no use. Two: no entry provided for the plug , so tight you will have to cut a hole in the side otherwise risk squashing the plug and causing damage.